An Ultra Capacity front-load electric dryer that produces real steam to help minimize wrinkles and eliminate odors on clothes. The Sensor Dry system detects humidity and automatically adjusts dryer settings. 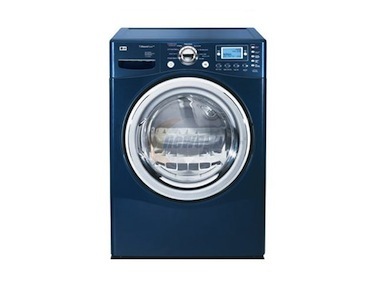 The dryerís electronic control panel has a blue LCD display for easy program regulation and monitoring. SteamFresh, SteamSanitary, Heavy Duty, Delicates, Normal, Cotton/Towels, Perm Press, Speed Dry and Air Dry cycles complete this electric dryerís 9 programs. Options like ReduceStatic, for reducing static cling, and EasyIron, for efficient ironing, are also available. The dryerís temperature levels range from Ultra Low to High, and you can opt to give your clothes to get less or more drying time. The drumís humidity is measured by the Sensor Dry system with Dual Humidity Sensors, while the dryerís air ducts and lint filter are monitored by FlowSense. The FlowSense tells you if thereís lint buildup or a blockage in ducts. The 7.4 cubic feet NeveRust Stainless Steel drum has a drying rack to hold non-tumble-dry pieces like stuffed animals. A faint, low-watt light is installed for easier drum access. The front electronic control panel has a Dial-A-Cycle knob for program settings. The controls are labeled in three languages: English, French and Spanish. A blue LCD display tells you the cycleís status and remaining time. Stack the dryer unit on top of a matching washer with the optional stacking kit or place the unit on top of a drawer pedestal. Both pedestal and stacking kit are sold separately. The dryer comes with 4 leveling legs that are fully adjustable. The material used for the dryerís top plate is porcelain, and steel for the cabinet. Its large reversible door is made of clear glass and outlined with chrome. White and Navy Blue are the only available colors for this model. The FlowSense Technology detects air duct problems. Steam is used to minimize wrinkles and odors. The dryerís Electronic Control Panel is labeled in three languages. The EasyIron option leaves the clothes slightly damp for easier ironing. By using the Antibacterial option, germs and bacteria are eliminated. It has 9 programs and 9 options. The Sensor Dry system adjusts dryer settings automatically. Status information is presented on the unitís blue LCD display. It comes with a drying rack for non-tumble-dry pieces. Dryer programs can be customized. The large, transparent door is reversible. It costs much higher than other dryer brands. The FlowSense Indicator sometimes give wrong information. Electric dryers consume more energy than gas-heated dryers.